Reader LauraH asked, "As a fellow glasses-wearer and jewellery maven, do you have any advice about combining them with earrings?" I wear glasses only for close work; they're not on my face all day. But as I thought about it, there are a few ideas swirling there in the background. Let's deconstruct the elements and begin with glasses, which are an accessory stuck to your face. Imogen Lamport of Inside Out Style has written some useful posts on choosing glasses, like this one. Adding earrings piles another visual element on that face. You'll be the judge of how busy you want to get, but if you (and I) aren't careful, we can pile on a lot, because you can come to think of your glasses as just part of you. Lafont's "Borgia" is an intriguing frame I'd be tempted to own as a second or third pair. But there's a lot of visual information here, and if you pick the frame in red, hel-lo! But I have at least one glassy-lassie friend who would wear the heck out of these. 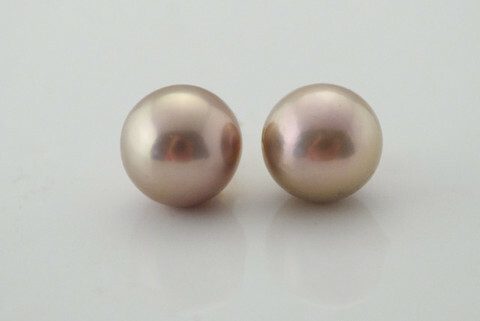 With them, I'd choose pearl studs, for example. I'd save to get them big, with gorgeous overtones, like this 12mm Kasumi pair from Kojima Company; price, $1,250. 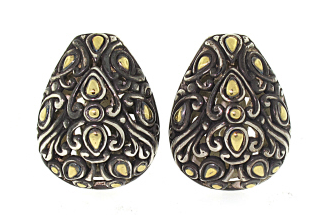 These are hardly retiring earrings but they do not fight with the frame's detail. 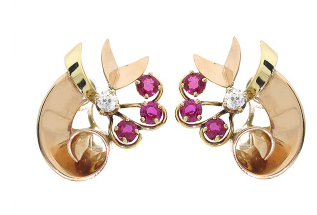 If you're a brave girl, you could ramp up the visual energy and wear something that goes toe to toe with the frame, like a pair of retro ruby and diamond earrings set in 14k, from Beladora. (Price, $1,450.) As you would expect, the clothes with this are architect-office quiet. Kate Spade's Lucyann is the style I'm wearing currently. Though an anonymous commenter advised a change, they work for me, and I can wear several types of earrings with them. Most winter days I'll choose small diamond studs because the screw-backs hold securely as I whip hats or earmuffs off. 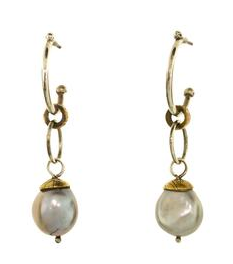 I also wear a pair of John Hardy earrings similar to those below, from Beladora: the 18k/sterling mix blends with other metals easily (Price, $250). Metal frames, especially the light, spare type, add minimal information, but if you wear that frame with metal earrings, that's a lot of hard texture at your face. It will look alright, but it's a colder effect, as shown by this Vera Wang black titanium pair, which I like very much. They are graceful and clean but lack the warmth of the acrylics, especially those with laminated colour or tortoise-shell mottles. 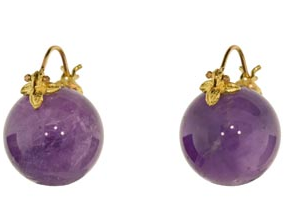 With them, I'd choose an earring that's more gem than metal, like Gabrielle Sanchez' amethyst globes, $1,250 at TwistOnline.) Nor would I confine the earring setting to a dark metal unless I wanted that goth-girl effect. And, LauraH and others, how often do you update your frames? Do you choose for yourself or take an optician's advice? My friends Alice teases her husband: his aviators, over 30 years old, are now back in style. But we don't want to wait out a turn of the retro wheel! I'm just waiting on my first pair of bifocals to be ready but I have a feeling I'll be one of those types who reverts back within two weeks. I felt sick after a two minute trial in the optician and could just feel the migraine around the corner. I change glasses every, hmm, 8 years or so, these latest basic ones are coming in at £750- could weep! Funny, I have never even thought about what my earrings look like when I wear my (reading) glasses. I have metal frames on my prescription glasses. Then again, I also have about ten pairs of store-bought readers of various designs stashed around (home, office, car)for the times I can't find my regular ones. Matching earrings to all of those would be a futile project :). Nothing ages you more than the wrong glasses but your frames are fine. Most opticians are not style experts, they will steer older women to those lightweight steel or rimless Holly Petraeus style what I call "the general wives" similar to the ones you show. My optician tried to steer me to thin vertical height ones that do not suit a rectangular face, so no they aren't style mavens, instead I picked some Nana Mouskouri types that are back in style. Nothing screams old lady more than thin metal or rimless so stay far away. Your other option and what I suggested to another woman who has problems reading/computer is try the new multifocal contact lenses. Most optometrists never tell you about them because "old" ladies are supposed to not want to try anything new and cannot change. I also wear daily multifocal contacts which are new on the market, I was actually the first customer they sold them to at my optometrist. They just never suggest them to anybody. I was lucky to have an enthusiastic new graduate optometrist who didn't yet have "senior blinders" when it comes to women over 50. You can wear these even with dry eyes. Imagine my excitement when I saw that my question had inspired your post! What a great way to begin the day, thank you. I use an ophthalmologist rather than an optician, then go to a place that only sells frames. Sometimes I've had great advice, other times not. Just had my colours done so I'm thinking about how to integrate that information with the face shape information from Imogen Lamport. All this thought may be too much for one frail pair of glasses but since they cost so much (graduated lenses) it's hard to just wing it. I'm working towards choosing something fresh that's still 'me' rather than what's 'new'. All part of my self renovation project! Great topic! I'm a bit of an eyewear hound, and love trying new looks. I'll usually update once a year, though sometimes I have a frame that I love (like my current most-worn pair) and am in no hurry to change. I think a minimalist design, "nerdy" tortoiseshell style suits me best at the moment. Because I keep my glasses fairly understated, I feel it leaves me a lot of latitude with my earrings. Mine are "progressive" lenses too (bi-focals) and I found I adjusted to them quickly. My husband, OTOH, still struggles with his after a year. Everyone reacts to them differently. I'm too squeamish around my eyes to wear contacts, have never tried them. Me again. Your post sparked a lot of thoughts, about glasses and about earrings. I love earrings but have a habit of reaching for the same few pairs. Hmmmmm. I was thinking about some new purchases this year - now I'm wondering if that's necessary or just magpie behaviour. It's refreshing to take a step back and really look at habits, thanks again. I recently helped my husband select two new frames at a high end eyeglass shop. We have had the best luck at this shop, so we go, prescription in hand and ask for advice. This last time, I KNEW that the young woman wasn't quite right with her suggestion. SO---I asked if the other woman who works at the shop could enter the discussion. She did, and agreed with my assessment was what looked best on him. (I had not revealed my opinion.) SO--my advice if you are a regular glasses wearer is to find a place that has the best frames and try to find someone there who really knows what looks best. If you are not sure about a purchase, go somewhere else--or come back at another time. Eyeglasses are BIG purchases these days. My husband is so pleased with his new frames. In fact, he says that he has gotten compliments. The frames are not flashy in anyway, but they have really changed his look. I only wear glasses when I drive and when I go to movies, so I tend to have outdated frames. Tabitha: According to those I know who've don it, it can take 6-8 weeks to adjust- something abut how the brain processes what the eye sees. Mary: I'm not suggesting matching, just pairing in a pleasing way. 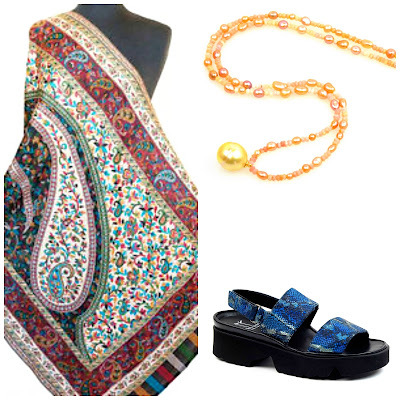 I have indeed seen frames and earrings in infelicitous harmony. Anonymous: That's right, they either don't care or are pushing the costilest to highest-margin lenses. But there are good opticians out there who know if you look terrific in your frames, you'll get complimented and asked where you got them. Are your frames those huge Tom Ford cats'eyes? LauraH: Suggest you try many. many frames with the info in the back of your head. I usually look for a neutral (but not dull) colour with texture and softness. Bright glasses are not my taste but sometimes I see them on others and love them. Pseu: Your glasses are always great and I notice you wear both coloured frames and neutrals. LauraH: There is a state between the poles of same few and magpie. Some women wear the same earrings every day, but I like to change, b/c my winter wardrobe is a "uniform". 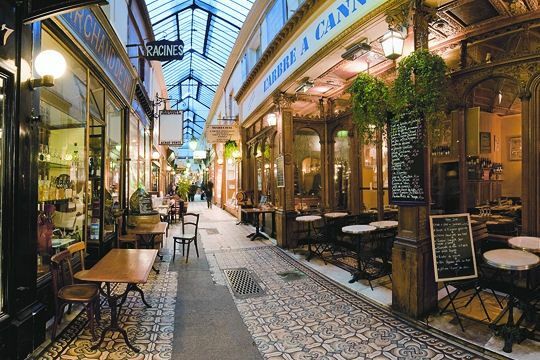 Susan: Great advice; some opticians or salespeople really care, others just want you in/out fast. If your frames are outdated, time for new ones- can change your whole look. As I just had Lasik, this post came a little late for me, but it was something I was always conscious of. For that reason, my rule for glasses was that there be no metal showing. Tortoise shell or black frames only, and truly plain ones were very hard to find. That way, I could wear earrings in any color metal. Bobbi Brown is always an inspiration, glasses-wise. I'm curious -- what is your clothing "uniform" for winter? I wear mine with diamond studs everyday and in the evening I add more flash and often remove my glasses putting them on only for reading menus etc. BTW I quite like your choice of frames, they suit you. I agree with most of this. I've been wearing progressives for about 7 years now and it took me several weeks of tripping and kicking the dog to get used to them, Tabs, hang in there. Opticians are notorious at giving poor style advice on eye frame choices. When I was actively Image Consulting, this was one of the most important articles I assisted my clients in choosing. Rimless is very ageing...wire on the top only, can dissect the eye area and make one look angry...tortoise in one of your inherent colours is usually the most pleasing and versatile. At close to $1,500 a pair, I choose carefully and usually a flattering (for me) shape that is on the upswing of a trend so I get multiple years wear out of them. Eyeglasses are jewelry for your face so earring coordination is fairly important. Great ideas here...lusting now for the Amethist Globes!! Great topic! I also was lucky to find an optometrist who worked tirelessly with 58 year old me to figure out a "monovision" contact lens solution: one eye distance, one eye for reading. It takes some work, isn't "perfect" but I love the freedom from daily glasses. Then I stepped out of my box, and with a lot of encouragement (my optician even let me take the frames home for a week! ), selected cateye tortoiseshell frames. I love them for days where I don't want to "do" my eyes much, since the "high information" does it all! Simple studs, yes, but I find myself drawn to them anyway these days. sisty: I think you're a metal woman or not, like ballerinas or red lipstick. Torty or a mottle is my best material too. My winter uniform is dark pants or trouser jeans and a cashmere v-neck (in colour); sometimes with a shawl or scarf. I might occasionally vary this with a black, narrow skirt. Only bought the ones I'm wearing in my blog photo b/c I thought they were lost. 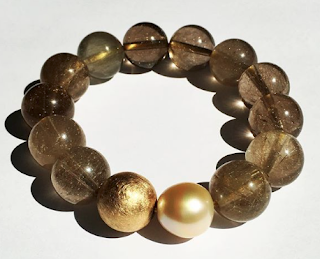 Well Styled: Yes, jewelry for your face! I don't wear them except for close work and would find contacts a huge adjustment. Great topic as I usually think about changing my frames in January every two years or so. Frames are such an important purchase considering they are both functional and reflect individual style -- we also wear them more often than any other item in our wardrobe (except perhaps a watch). I'm fine featured with a realtively angular jaw line so it takes me ages to find something suitable. The "old lady" style glasses actually look good on me although I always get the top frame in a colour, plum, which goes well with my brown hair and teal eye colour (Diane Keaton wears a similar style). I think it is very important to select eyeglasses that reflect your personality and suit your bone structure/features and not just whatever is on trend. I forgot to mention that I do take care in choosing sunglass frames as I have to wear them when driving (and wear them for years and years--until they break or are lost). Last time I went shopping (at the same high end optical shop I mentioned above), the purveyor insisted that I not choose frames that rested on or obscured my high cheek bones. Ok. I choose some that I loved, but they did not have a flexible nose piece and caused gouges on the side of my nose, even though they looked great and ostensibly fit. I took them back , and, as a testament to the customer service of this shop, they took them back. I ended up rather quickly choosing another pair (Maui Jim) with a flexible nose piece. They are comfortable. My husband thinks they look fabulous on me, but I have never been comfortable with them. So---another tip---consider whether you need a flexible nose piece --or not---. And, are others always right when they say a pair of glasses are perfect for you? Or, does your opinion count as well. All things to consider. Choosing frames is not easy! I'm astonished at the prices some of you are paying for glasses! I wear multifocal contacts ( and have worn contacts of one form or another for over 40 years). I LOVE contacts and would not wear glasses full time unless I absolutely had to, but I do still have a pair which I wear when I first get up, and late at night. I need the most expensive type of lenses, multifocal and ultra-thin, and my last frames were Ray-Ban; and I'm sure it cost less than $400. How on earth can one spend $1500 on glasses, I'm wondering? Anon@ 2:09: Ever notice how some years nearly all frames seem to be alike, e.g., tiny rectangles? If you know the shape you want, sometimes the selection is scarce. Other times, not even looking, bank! There is a fab frame. Susan; Since this post is about earrings (not som uch frmes types) I had not even thought of nose options, but yes, even if the frame is smashing if it leaves you feeling like youre wearing swimming pincers, back to the store. Jill Ann: The markup on frames is astonishing! There are several thrifty options: used frames (or dead stock) available on eBay or at flea markets, and buying in countries where they are much cheaper. An acquaintance buys frames when he is in India (for his entire family); they are unsold stock from very well-known makers. He carries the rx and has the lenses put in there, too- total cost is $40-$75. Splendid post! I have such a small (narrow) face that I have a difficult time a) finding glasses that fit properly; and b) wearing large earrings of any sort. I tend to wear my 8.5mm pearl studs most days...wanted a larger pair but they looked ridiculous on me. Your suggestions are lovely, and were I able to wear any glasses other than the 1930s-style horn rims to fit my truly awful prescription, I'd snag a couple of these picks in a heartbeat. I just got a new pair of frames, heavy plastic wine-red ones that look great on me. I still wear my old, almost invisible Ralph Lauren-frames at least every other day, and on recent photos I have realized that my usual earring style doesn´t go at all with these new frames. Probably, I should go without earrings, since they are so dominant visually compared to the old subtle frames. Wow, I never figured my glasses into the equation of earrings. I feel naked with out earrings everyday, and I wear glasses everyday. In fact I think the glasses hide a few lines I might have. But I always wear glasses and earrings and never think any thing of it. Viktoria: a photo will tell you; the frames sound chic! Sandra: I did not give it conscious thought myself till asked the question. But I guess it was back there in my brain, b/c some earrings just stay in the box when I have my glasses on. You always look great in your glasses. I tend to like them on other people, not me. Glasses take up too much area on my small face. I like the combinations you've pictured here. That explains it. I've been wearing the wrong style glasses! what kinda earrings go well with cat eye glasses?